Chinese Culture: What Is Ang Pao? Don’t know what is an angpao? 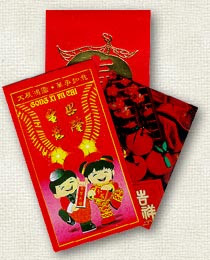 It’s called Red Packet when translated to English, and Chinese adults usually put some money inside and distribute them to their children and relatives (a generation smaller than they are). However, an unmarried adult is not, erm, ‘qualified’ to distribute angpao. I would still remember last year’s Chinese New Year festival when all of my extended family relatives, approximately 100 of them, swarmed to one of my relative’s bungalow to celebrate this unique festival. The entire house was so crowded that I nearly got squeezed into a pancake. We children went on a crazy goosechase after all married adults to get as much angpao money as possible.